The headline for Jodi Rudoren’s July 5 New York Times story captures the ugly report in all of its appalling harshness. 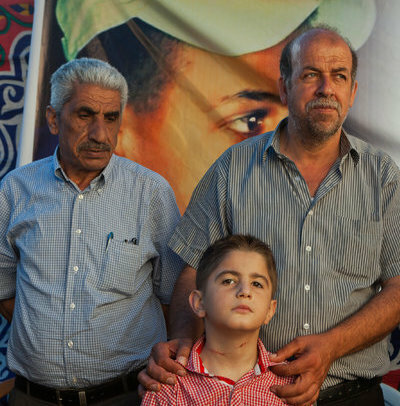 The picture at right, from the New York Times, is that of Muhammad Hussein Abu Khdeir’s father, greeting guests at his home Saturday. Standing with him is Mousa Zaloum, 8, a boy from a neighbor’s family, whose neck was said to have been cut in a kidnapping attempt. “Muhammad Abu Khdeir, 16, spent his last hours before being abducted, beaten and most likely burned to death in one of his favorite places, doing some of his favorite things. The Associated Press reported Sunday that Israeli police have arrested several “Jewish suspects” in connection with the crime. No names were released. Palestinians believe the death of Muhammad Abu Khdeir, “was a revenge killing for the earlier deaths of three Israeli teens” near Hebron, in the West Bank. The Jewish Voice for Peace web site reported this week that the Israeli government has responded to the recent rash of violence by sealing off Palestinian towns, arresting more than 400 Palestinian and raiding over 100 homes. Israel has also carried out bombing raids in the same time period. Pete Seeger’s classic folk song asks, “when will they ever learn”? What needs to be learned in this conflict is that this is no ancient blood feud which has led to this suffering. The conflict derives from a military occupation in which thugs on the occupiers’ side of the conflict are allowed to increasingly spin out of control, roaming streets and forests to brutalize a captive population whose only weapons are stones and largely ineffective rockets. “On Saturday, the Palestinian attorney general said that an autopsy had found soot in Muhammad’s lungs, suggesting that he had been burned alive before his charred body was found in a forest. Superior military power solves nothing, Rather, it emboldens violent conduct. As a consequence, that conduct evokes the memory of brown-shirted party members rampaging through the streets of Germany’s towns and cities as the Nazis came to power. Muhammad’s mother, Suha, sat in the center, interrupting interviews to cover her tears with an orange washcloth. Muhammad was the fifth of her seven children, a goofy jokester who danced the dabke, a traditional line dance, in a folk troupe. He was a devoted fan of the Real Madrid soccer team and went weekly to a barber to keep the sides of his head closely shaven. His mother said she had just given Muhammad breakfast when he left at 3:30 a.m. Wednesday for the prayer that starts the daily fast during the Muslim holy month of Ramadan. There is a stark contrast between this Jerusalem domestic tableau of community and family grief, and the game-playing of those U.S. religious leaders who refuse to take even minor economic steps to demonstrate solidarity with an occupied people. When will they ever learn? The answer is not until we learn to see ourselves as history will one day remember us. Start with the ongoing conflict over divestment within the Presbyterian Church USA, and look at this conflict as a replay of an American southern religious struggles in the the early 1960s. The horrific stories of this past week recall a development in the struggle for justice in April, 1963, when Dr. Martin Luther King, Jr., was confined in the Birmingham city jail. King, (right) and several colleagues had been arrested for demonstrating against racial segregation. In April, 1963, a group of church leaders refused to take action to stop the brutality and killings of racial segregation in the American South. Go slow, they advised King, a man who had lived in the state of Georgia under the tyranny of segregation his entire life. He was finished, he said, with “going slow”. In his jail cell he sat down and wrote, at first on scraps of paper, the famous document that came to be known as the “Letter from Birmingham jail”. That letter was first published in The Christian Century magazine. American church leaders who want to “go slow” in Palestine in 2014, should spend this week contemplating the relationship of the 1963 church leaders’ counsel to King to “go slow”, to the “go slow” mindset of those 2014 U.S. denominational leaders who continue to “debate” what should be done to deal with the asymmetrical power struggle between Israelis and Palestinians. The parallel between a U.S. segregated society in 1963 and the asymmetrical struggle between Israel’s occupation military force and an occupied Palestinian population should be painfully obvious. There were divestment supporting Jewish observers at the 221st Presbyterian USA General Assembly—the denomination has been around more than two centuries—when that body voted to divest all financial holdings from three U.S. corporations doing business in the Occupied Palestinian Territories (OPT). The vote was close but the GA did vote to get out of the business of financing military occupation. The vote to divest from three companies, Caterpillar, Hewlett-Packard, and Motorola Solutions, was a political contest between Presbyterian delegates who favored the divestment resolution and pro-Israel delegates and their Jewish Zionist-oriented observers, who opposed divestment. One Jewish observer tried a tactic that smacked of good old fashioned U.S. political horse trading. That observor, Rabbi Rick Jacobs, offered to guarantee the delegates a personal meeting between the PCUSA General Assembly moderator, Heath Rada, and Israeli Prime Minister Benjamin Netanyahu, if the delegates would vote down the divestment resolution. That ploy failed. Rada (shown here) maintained a good spirit during the debates. As votes were tallied, he had to respond to efforts to halt the voting through procedural maneuvers. As each maneuver was tried, he said it looked like he might be packing his bags to fly to Tel Avi. When the maneuvers were rejected, he joked that he would have to unpack his bags. During the Assembly, an attempt was made by the pro-Israel contingent in the GA to ban sales of the study book, Zionism Unsettled, from the denomination’s book stores. That effort was defeated by assembly delegates. Zionism Unsettled is, of course, a study guide that did not claim to be church doctrine. It was a guide designed by IPMN to explain the mysterious hold that a 19th century political ideology called Zionism holds over contemporary 21st Protestant church leaders. Well after the General Assembly adjourned and the delegates returned home, IPMN received an unexpected shock. 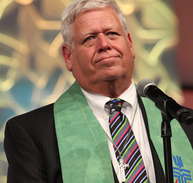 The PCUSA executive committee announced that “since Zionism Unsettled was not in keeping with current church doctrine”, it would not be sold from the denomination’s book stores nor on the denomination’s website. In short, despite the defeat of that action by the GA delegates, the defeated action became official church policy. Despite this setback, IPMN reports that it will continue to distribute ZU through its web site. Delegates for that 2016 General Conference are already being elected in regional conferences. Predictions vary, but the Methodists are expected to be as divided on the issue of divestment as their Presbyterian colleagues. In a recent posting, I called attention to a quote from Rashid Khalidi, who quotes William Quandt. Quandt sums up the Palestinian dilemma in past U.S. secular presidential decision-making with a simple declaration: “the Palestinians had no domestic constituency”. Religious communities in the U.S. are supposed to function as the nation’s conscience, the moral center that speaks for the voiceless and the oppressed. Unfortunately, in the matter of Israelis and Palestinians, with some scattered but notable exceptions, our religious communities remain trapped in their own self-imposed political prison, euphemistically referred to as “interfaith dialogue”. Despite its innocuous appearance, the phrase, “interfaith dialogue” refers to the amazing assumption that to maintain friendly relations with people of the Jewish faith, Christians must overlook the atrocity of the modern state of Israel’s military occupation of the Palestinian people. The picture at top is by Rina Castelnuovo of The New York Times. 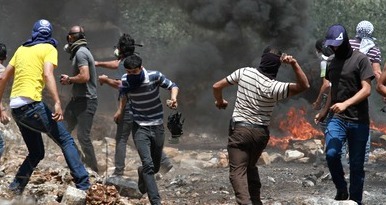 The picture depicting stone throwing Palestinians is from The Guardian by Barcroft Media. 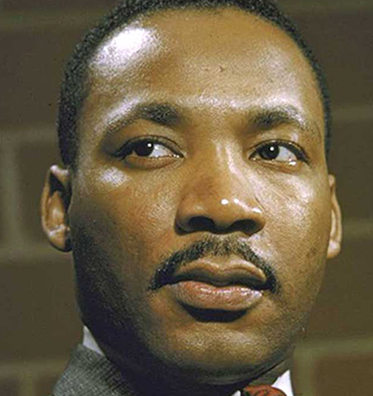 The picture of Dr. King is from the History web site. It is a Life/Getty Images. This entry was posted in Middle East, Middle East Politics, Presbyterian Church USA, United Methodist Church. Bookmark the permalink. I like your mention of “asymmetrical” power and your connection to MLK. How the Buchanan’s of today* cannot see that parallel is beyond me, but they have been so blinded by their own intransigence that now, all they can do is hold the line against their own embarrassment. (*PEPs – Progressive Except on Palestine). Not a peep about divestment in the new issue of Christian Century. Looks like their playbook had nothing about divestment actually being voted in. It is a curious feature of our discourse that we ignore assymetry. The Israeli government response to the murders of the settler youth was to conceal their fate to justify a lockdown and search of the West Bank resulting in deaths of Palestinians, widespread destruction and arrests, aerial bombing of Gaza and blaming of its ruling party Hamas. In the search for Abu Khdeir’s torturers, no such fate befalls Tel Aviv or West Jerusalem, much less any illegal government sponsored settlements. And churches still have difficulty divesting from these hateful enterprises! 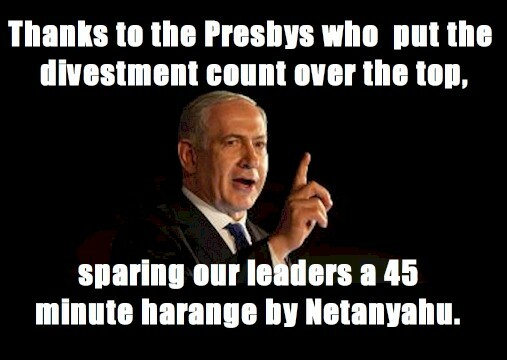 The Netanyahu invite extended by Rabbi Jacobs might have been stated: “Give in to our bullying here and your leaders are invited to Tel Aviv for more bullying.” In the same light spirit that Moderator Rada dealt with the situation, here’s a meme: http://www.aimeproject.org/memes/netanyahu.jpg . Thanks for the clarity and breadth of your report, Jim. US church leaders — most especially those mainstream! — must acquire some Jesus Christ-like moral outrage and denunciation of evil. The world must recognize that a psychotic frenzy is roiling and despoiling the Holy Land, and its name is Zionism. We must all stand with the victims: the courageous, steadfast, endlessly tormented citizens of the State of Palestine. Jim, Thank you for a brilliant article. And that last line ….. I love it! Since a long while, I have come to the conclusion that there are many Pharisees in our churches who cannot, or do not wish, to differentiate between the “Hebrew Israelites” of the Old Testament and the modern day colonial settler-state that selectively chose the brand name, “Israel”. (They also considered, “Zion”, among other Biblical names). I wonder how these same people would have reacted, if Apartheid South Africa was clever enough to have named its colony, “Israel”, or “Zion”? As a Christian, I think that the Brand Name, Israel, is a major “psychological-mental block” that afflicts many Christians. So many do not seem to register that the population of the current colonial apartheid state of Israel is NOT even composed of the Biblical “Hebrew-Israelites” DNA, as such. In fact, they are rather made up of a “mix” of some Semitic, but “Non-Hebrew”, Sephardic Jews and some “NON-Semitic” European Ashkenazi Jews who descended from the Khazars of the Caucasian region of Eastern Europe. (Read, “The Thirteenth Tribe”, by Arthur Koestler). In my opinion, it is not this “mix” that matters at all, but rather it is the brand name, “Israel”, for those who are excavating for an easy excuse to support Israeli occupation of Palestine. They see it in our Holy Bible and in our Hymn Books, Sermons, Sunday School classes, in simplified Bibles for easy reading, including cartoons, in movies of old and modern times, in novels and school books, in speeches of politicians, in media galore…….. Most conveniently avoid the fact that, in Christian “religious” terms, and after the (First) Coming of Jesus Christ, the definition of “Israel” changed to mean, the people who believe in God through Jesus Christ our Savior. In other words, “Israel” is supposed to mean “All the Christians” of the world. This obviously includes “Palestinian Christians”. I am not calling for such differentiation, by any means, but it is the other way round that makes it a problem of criminal proportions because it calls for the theft and usurpation of a homeland, on grounds of a false brand name. But, for such Church leaders, the brand name obscures their sight and they cannot see occupation, apartheid, tyranny, ethnic cleansing, land theft, genocide, collective punishment. All that takes second row. First row is reserved for preserving business interests of inter-religious dialogue, at the expense of preserving the essence, teachings, and messages of Christianity-Judaism-Islam. It is all replaced by, “You scratch my back, I scratch your back”. Jim — thanks for another clarifying writing — about what’s happening to Palestinians, about the realities of Israel, and about the too-refined hesitations of US churches. And thanks for spreading word about “Zionism Unsettled” and its present availability.